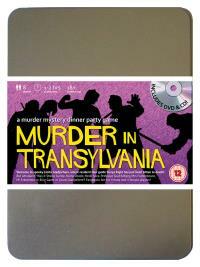 You've been invited to play the role of PROFESSOR GRAF ENBERG in Murder in Transylvania. Who killed Sonya Right? Welcome to Castle Gladjorhere, home of the world’s one and only Transvampire with a soul! Visitors from all walks of life have come to witness the thrills and chills of this genuine Transylvanian house of horror, all of which will be revealed by the resident tour guide Sonya Right. But shortly after dinner Sonya is found in her room with two small puncture wounds in her neck. Join us to find out who sucked the life out of her! Academic (his theories always hit the spot!) Costume Suggestion : Smartly dressed in a grey three piece suit accompanied by a monocle or pocket watch is how you like to present yourself. Hair that makes it looked like you’ve just received shock treatment is fundamental, but a stick for pointing at things is optional. You are a highly respected English professor and the world’s foremost expert on Transvampires. You have just published your very controversial thesis, based on the life of Count Gladjorhere, which you entitled “Dressed to Kill”. Now you are being invited to lecture at almost every university in the country and you are being hailed as a genius by your peers.